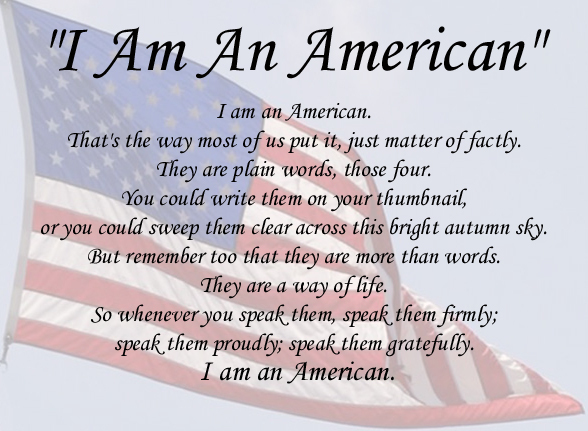 This past week at the Little Caesar’s Pizza Bowl in Detroit, Michigan I was reminded as I am at every home Purdue Football game how proud I am to be an American as well as a Purdue alumnus (my wife, Hope, is also an alumna). 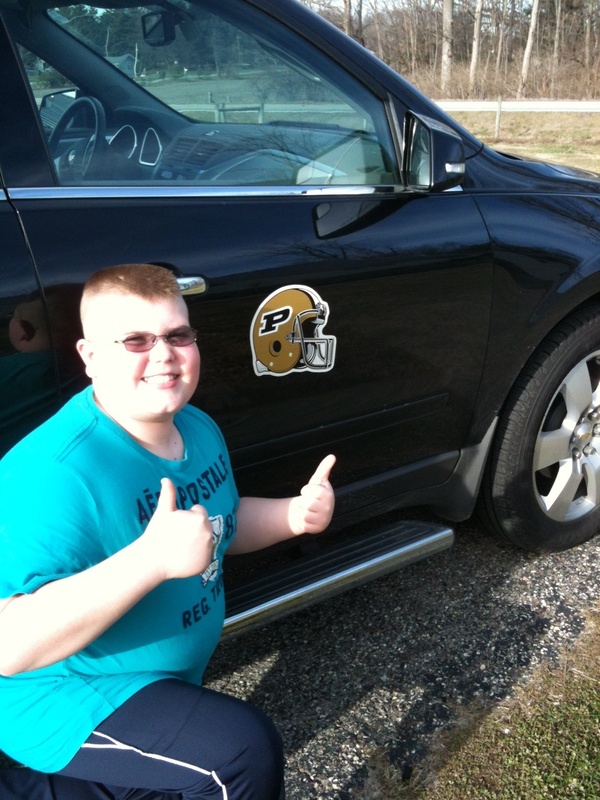 We made the trip to Detroit a family trip and were not disappointed as our beloved Boilermakers won by a score of 37-32. It was an exciting game with one of the most interesting fourth quarters of a football game I have ever witnessed (I’ll leave that for another story if you did not see the game). 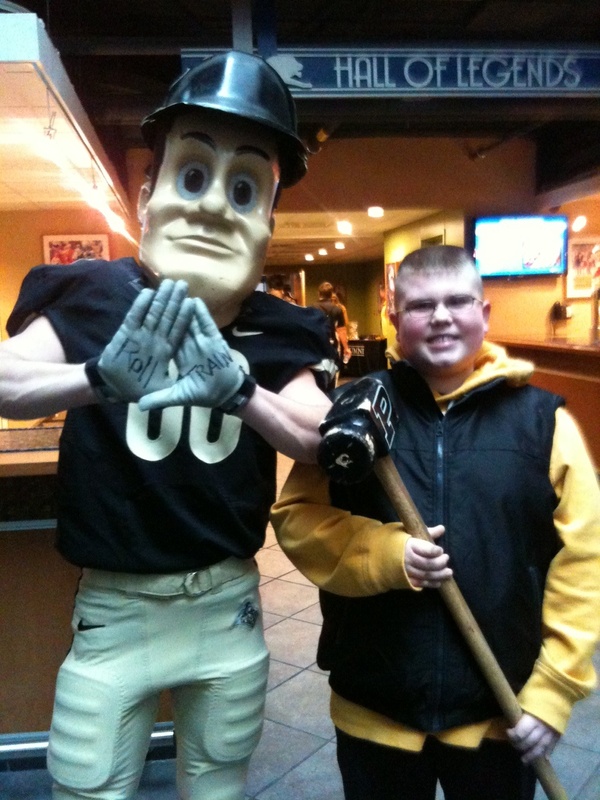 We also had a great time pregame with Purdue Pete and all the other bowl festivities. My post today, however, deals with what I consider to be one of the most moving pregame shows in the world. The Purdue University “All American Marching Band” does a show leading up to the national anthem that includes a portion called “I Am An American.” For a complete story of this show that was first done in 1966 click here. 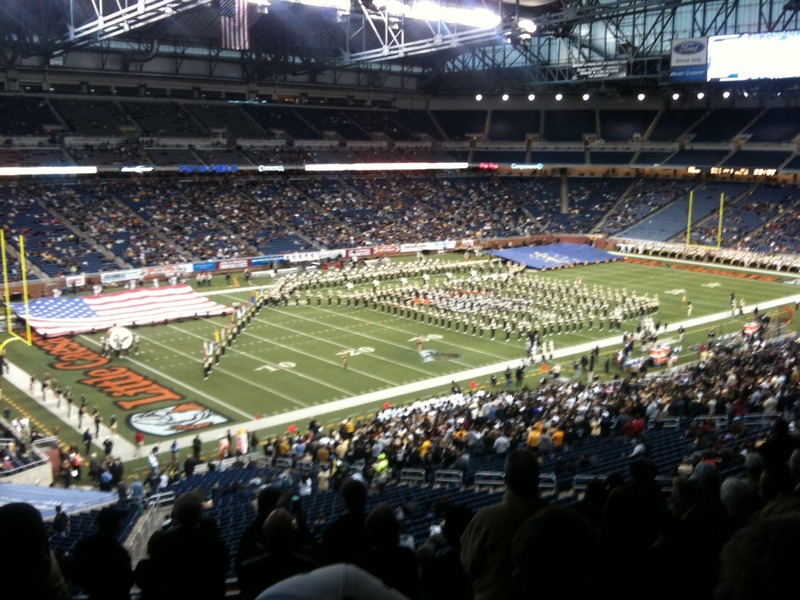 To the left is a picture of the band’s final formation in Ford Field as “I Am An American” was read. I still get goose-bumps and tears in my eyes every time it is done. Amazingly, I had a Western Michigan University fan tell me they were most looking forward to seeing the Purdue “All American Marching Band” perform. That’s pretty cool! 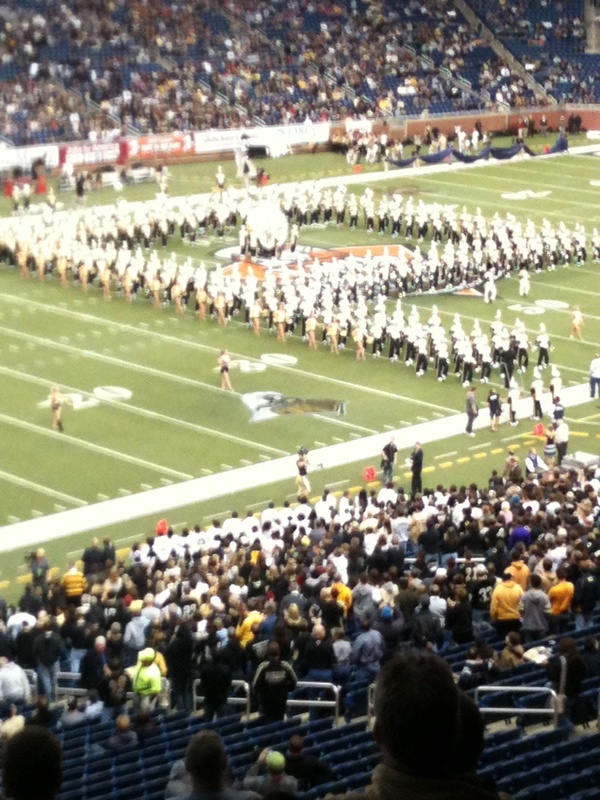 Traditional "Block P" by the Purdue "All American Marching Band"
I am not going to write about all of them, but suffice it to say; you need to read the book! As an educator and leader I must envision exciting and enabling possibilities. As Kouzes and Posner said, “In some ways, leaders live their lives backward. They see pictures in their mind’s eye of what the results will look like even before they’ve started their project, much as an architect draws a picture or an engineer builds a model. 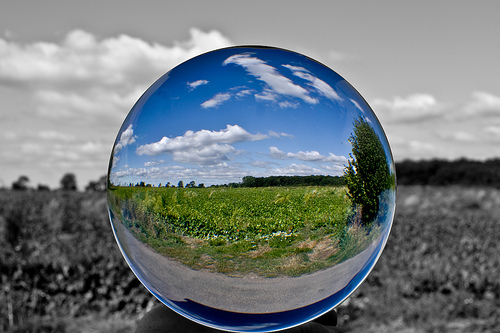 Their clear image of the future pulls them forward.” As a teacher leader it is so true that I must live my life backward. It is important that we see the end goal of what a great school and educational system looks like. Indiana’s State Superintendent of Public Instruction, Tony Bennett, has been a great modeler of this. As a teacher I must live life backwards, by seeing where the students need to be at the end of a course. So how does one live life backwards effectively? VALUES, PRIORITIES, & DREAMS! An important philosophy I have is allowing students to be bad at something before they can become good at it. The best example I can think of is Scott Martin, a student who was a terrible public speaker. I use many student presentation activities in my classes, so this young man had plenty of opportunity for improvement. While having Scott as a student, a teacher made a comment to me that he did not have students make presentations because they were so poor at it. I remember saying, “Shame on you! How can students get any better if they are not allowed to try, with us helping them?” We must be willing to stand beside our students and allow them to be bad at a skill while we are teaching them to become proficient. Scott Martin went on to become a gifted speaker. In fact, he emceed the opening ceremony for our new welding shop. He did an outstanding job for the ceremony which had school board members, advisory committee members, business and community leaders, and parents in attendance. As Kouzes and Posner said, values serve as guides to action. It is important to have our values driving us. As a teacher leader those values are equally important. Many times when collaborating with other teachers it is easy to let that learning time turn into a gripe session about issues that are about the adults (general frustration) and not the students. It’s easy for me to bring the group back to what’s important by reminding them that what is important is the goal of a first rate learning environment for the students of Lebanon High School. In order to speak up w must know what to speak about. Our values give us that voice. Kouzes and Posner said, “Personal values clarity drives commitment.” So for us to have our priorities in order and dreaming positive dreams we must first know what we value most. Scott Martin graduated May, 2009. Author has permission to use this story. For my post this week I thought I would do something a little different and share my top ten highlights from what I consider the best book I read in 2011. 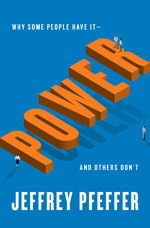 The book is Power: Why Some People Have It – And Others Don’t by Jeffrey Pfeffer. I read this book a while ago, but I have found myself using or thinking about the content every day. Get over yourself and get beyond your concerns with self-image or, for that matter, the perception others have of you. Others aren’t worrying or thinking about you that much anyway. They are mostly concerned with themselves. The absence of practice or efforts to achieve influence may help you maintain a good view of yourself, but it won’t help you get to the top. Power tends to produce overconfidence and the idea that you can make your own rules, and these consequences of having power often cause people to behave in ways that cost them their power and their position. One of the biggest mistakes people make is thinking that good performance – job accomplishments – is sufficient to acquire power and avoid organizational difficulties. Therefore, your first responsibility is to ensure that those at higher levels in your company know what you are accomplishing. And the best way to ensure they know what you are achieving is to tell them. Being memorable equals getting picked…You can’t select what you can’t recall. “Feedforward,” which emphasizes what people need to do to get ready for the subsequent positions and career challenges they will confront…focusing on what you need to change to accomplish future personal goals can be much more uplifting than going back and reviewing past setbacks or considering areas of weakness. Launching or re-launching your career requires that you develop both the ability and willingness to ask for things and that you learn to stand out. People often don’t ask for what they want and are afraid of standing out too much because they worry that others may resent or dislike their behavior, seeing them as self-promoting. You need to get over the idea that you need to be liked by everybody and that likability is important in creating a path to power, and you need to be willing to put yourself forward. If you don’t, who will? Condoleeza Rice is right: people will join your side if you have power and are willing to use it, not just because they are afraid of your hurting them but also because they want to be close to your power and success. There is lots of evidence that people like to be associated with successful institutions and people – to bask in the reflected glory of the powerful. People give away their power by not trying. If you don’t try, you can’t fail – which protects our self-esteem. But not trying guarantees failure to win the competition for power and status. The best, most talented people want to work with those with the most power and resources, so those with access to important resources have advantages in hiring precisely the sorts of smart, hard-working individuals who can further their success. It’s an old but accurate and important story: power and resources beget more power and resources. Your task is to figure out how to break into the circle. Now I am going to give you a bonus highlight: Scoop Nisker said “If you don’t like the news, go out and make some of your own.” I thought this was one of the most meaningful sentences in the book. If we want power we must be out walking the talk and creating good news by taking risks and making things happen. If you want to finish the year with a strong read or start 2012 off with power, this book is for you. I am so excited to share with you this week about a book that you all need to buy. The book is Great Educators: 30 Days of Restoration Workbook 2012 Edition. This workbook has been dedicated to all the great educators in the nation. The book is a 30 day exercise for educators to renew an restore their excitement and dedication to their profession. Whether you are a new or experienced teacher, this workbook will help you bring joy and enthusiasm back into your classroom. This book gives teachers a chance to explore what other educators are doing in their classrooms and schools to be powerfully influential as teacher leaders and highly effective teachers. Each day’s story comes from an award-winning teacher that was nominated to be a part of the book. Why am I so excited? Because I am featured on Day 24. My plan for Implementing Cross Department Collaboration is outlined in this chapter. Day 24 begins with a quote from me: “Teacher expectations affect student achievement, so it is important that we have high expectations for our students. My personal mission is to use rigor, relevance, and relationships to be a steward of high student achievement.” My chapter deals with realizing the importance of collaboration. It is important to take time to have a conversation with one another and share successful teaching strategies. Then, teachers will have the opportunity to make adjustments that allow for the creation of innovative ways to teach students how to learn to learn. To do this I introduce a what I call Cross Department Collaboration (CDC). A plan that my Agriculture Science Department uses to meet with anther department each month to share best practices or learn new strategies. I will let you read the book to learn more about my journey with collaboration and leading our school to become a learning organization. I hope you will consider buying the book. Every chapter has a worksheet section at the end for reflection on the day. This book would be a great source of professional development. Happy reading. I would like to share some thoughts about and a process that my school is going through to improve student engagement. We all know that to maximize a student’s learning potential, the student must be engaged in the teaching and learning process. It seems that so much of what is happening in schools is either based on old models that are obsolete or so constrained that it doesn’t build thoughtful, responsible young people. Education cannot be about memorizing answers and pleasing the teacher, but must be about critical thinking, collaborative work, and knowing what questions to ask. Learning must be about connecting real world experience to core subject matter. We, as a teaching staff, are making a concerted effort to provide outstanding instruction to our students. Recently, we asked our students three questions and had small group discussions with all students. Those three questions are: 1. Why do students disengage? 2. 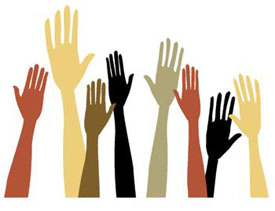 How do we improve student engagement? and 3. What can students do to improve engagement? As a teaching staff, we discussed the student responses and found four common themes as to how students are best engaged: 1. Students learn best from Passionate and Energetic teachers; 2. Students learn best from teachers that are Prepared and Creative; Students learn best when the material is Relevant to them; and 4. Students learn best when they best when they believe the teacher genuinely Cares about them. Next, when we get back from Winter Break we are going to have all the students to discuss what they can do to improve their own engagement. Those discussion items will then be coded into themes for action points of the students. Our goal through this process is to unlock every student’s and teacher’s potential to maximize their performance. I had the opportunity to be a part of a group of agriculture industry leaders providing input to Purdue University’s Presidential Search Committee. I took this role very seriously as I saw myself representing both agriculture and education. The Trustee’s and Search Committee’s goal is to match the skill-sets of the top candidates to what Purdue University needs now and ten years in the future. “My chief message today is a sobering one,” Secretary Duncan told officials from colleges and universities who were gathered this week at the annual Federal Student Aid conference in Las Vegas. “I want to ask you, and the entire higher education community, to look ahead and start thinking more creatively—and with much greater urgency—about how to contain the spiraling costs of college and reduce the burden of student debt on our nation’s students.” Click here to read his speech. Also, click here to learn more about the administration’s pay-as-you-earn proposal. I am sure you can imagine the energy of this almost 3 hour discussion. Purdue Trustee John Hardin said at the end of the discussion, “On a bad day this person needs to be God.” Not an easy task to find a person who can do all of the above. Keep in mind the search committee has had 40+ discussions like the one I was involved in. Personally, I want a transformational, unconventional leader who will think, as Secretary Arne Duncan has called for, creatively and reimagine higher education. 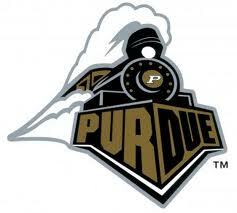 Specifically I want Purdue University to be a leader in bridging the gap between p-12 education and higher education. I continue to stress that with all of the great education reforms in p-12 education in Indiana occurring that higher education, including Purdue University, must also make reforms accordingly. Think about it, wouldn’t it be great if a students circumstance did not determine what type of education he or she received from pre-k all the way through college? Let’s all be unconventional leaders and solve the Iron Triangle of Higher Education – Quality, Cost, and Access.